Wow, I did not expect that… These are strangely good! Just as I am terrible at eating bananas before they go ripe, I’m awful at eating oranges quickly. I usually eat two or three and then I’m sick of the peeling and the smell all over my hands and the white pith everywhere and maybe I’m just weird?! It’s perfectly fine. I can manage just fine. Except I had five oranges on the counter threatening to go bad and requiring some creative re-purposing, and the thought of peeling and eating them was enough to make me want to throw them away immediately. Orange cupcakes. Have you ever heard of anything like it before? Banana, sure. Lemon, of course. But orange? It’s certainly news to me! Except, when I went searching for a recipe, it started to seem like maybe this wasn’t such a novel idea after all. 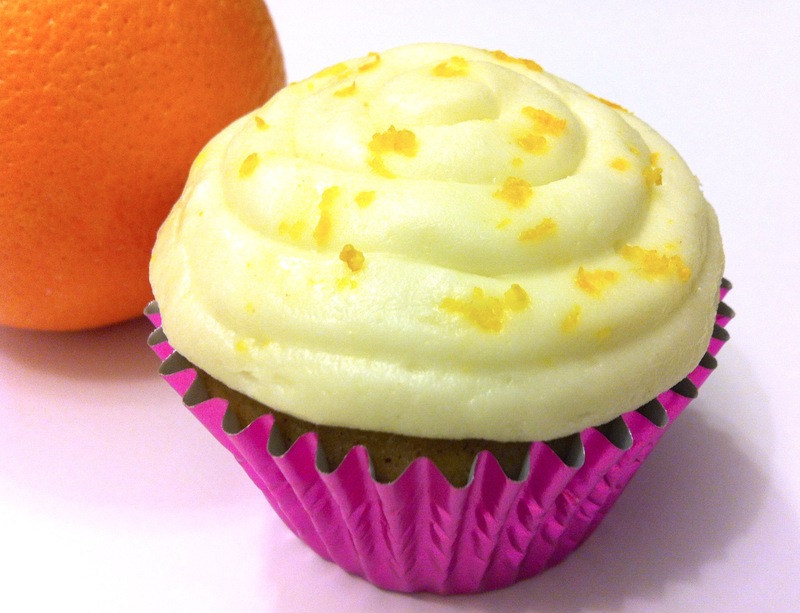 Plenty of people have made orange cupcakes, and they don’t seem to be too awed by the concept. Maybe you’re rolling your eyes because you eat orange cupcakes every day, but if this is news to you and you’re thinking, “Hmm I’m not so sure I’d like that…” then trust me on this: if you like oranges, you should like these cupcakes. I was a skeptic at first, but I was so intrigued by the idea that I tried it anyway. And I’m so glad I did! They’re moist, dense cupcakes with just the right amount of spices in them to make you smile. And the frosting (which is optional, because the cupcakes are fantastic on their own) is its own special breed of amazing. Makes 16 cupcakes. (Or, 15 because you have to eat one right out of the oven because you’re totally shocked that it even worked because despite the internet seeming to be an expert on orange cupcakes, this is still totally foreign to you and you need to make sure they worked before you give them away to anyone and wow they sure do taste good – who would have thought!) They were inspired by this Beat and Bake Orange Cake Recipe on Allrecipes.com, which I changed up quite a bit to make sure the cupcakes stayed moist, were bursting with orange flavor, and had some extra spices to draw out the orange flavor and keep things interesting. These were for a friend’s birthday. We had them in the department kitchen and I was so nervous when everyone started eating them, because what if my midnight taste buds misled me and these were actually awful?? Someone even had to remind me to take one for myself – I was so anxious that I just stood there, fingers crossed, hoping for the best. I can’t even begin to describe my relief when everyone really liked them. Succès!! 1. Preheat oven to 350 F. Prepare a cupcake tray with cupcake liners. 2. In a large bowl, whisk/stir together the flour, salt, and baking powder. Mix in sugar and spices until well-combined, then set aside. 4. Add the liquid mixture to the dry ingredients and stir until just combined, making sure that it mixes evenly. 5. Using a ¼-cup scoop, fill each cupcake liner to about ¾ full. Bake for 20-22 minutes (mine took 21), until a toothpick inserted into the center of a cupcake comes out with just a few crumbs on it (but no liquid-y batter). 6. Cool the cupcakes before frosting. While the cupcakes are cooling, let’s brown some butter! Put the 1/2 cup butter in a small saucepan and turn to medium-low heat. Stir gently and continuously. The butter will melt, then start frothing and bubbling (don’t get splattered! ), and finally go from a yellow color to a pretty amber. The whole process will take what feels like a few minutes (I honestly have no idea what it actually takes, as I wasn’t watching a clock) but the color switch happens very quickly. Once it’s amber, turn off the stove and move the pot away from the heat. Photos are provided below for reference. Let this sit for a bit and small brown flecks will settle to the bottom. 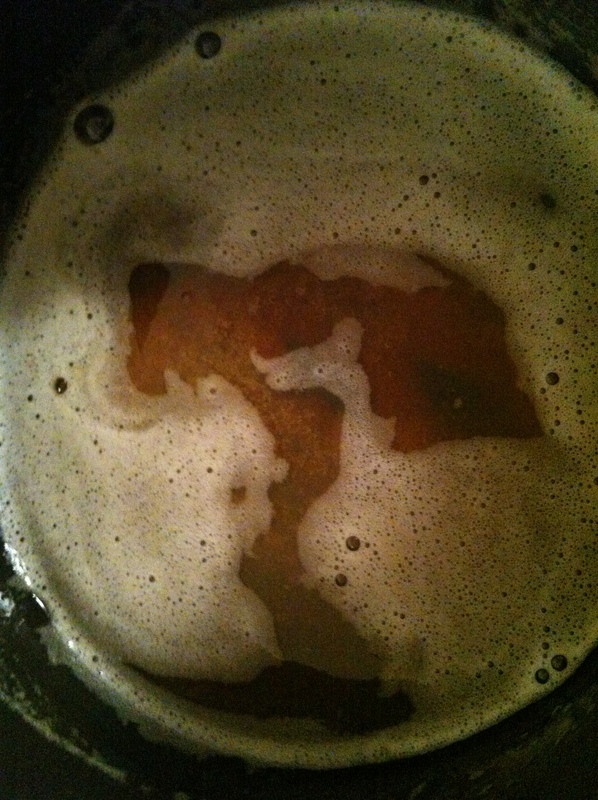 Slowly pour off the top, smooth butter and discard those brown flecks. Don’t worry about losing some butter – you’ll just add less powdered sugar in the next step. The browned butter needs to harden again before you use it, so unless you want to wait upwards of 2 hours for it to harden on the counter, pop it in the fridge for about 30 minutes. 7. To make the frosting, cream the browned butter in the bowl of a stand mixer until smooth. Gradually beat in 1/2-1 cup of powdered sugar and orange zest until well combined. Alternately beat in small amounts of orange juice, milk, and extra powdered sugar to bring to a fluffy consistency good for spreading on the cupcakes. The ranges in orange juice, milk, and powdered sugar are so you can keep adding bits of each until you’re satisfied with the amount and consistency of the frosting (liquids will thin and powdered sugar will thicken the frosting). 8. Use a knife or spatula to spread on frosting. Or, use a decorating bag or thick plastic bag with the tip cut off to pipe on frosting (what I did). 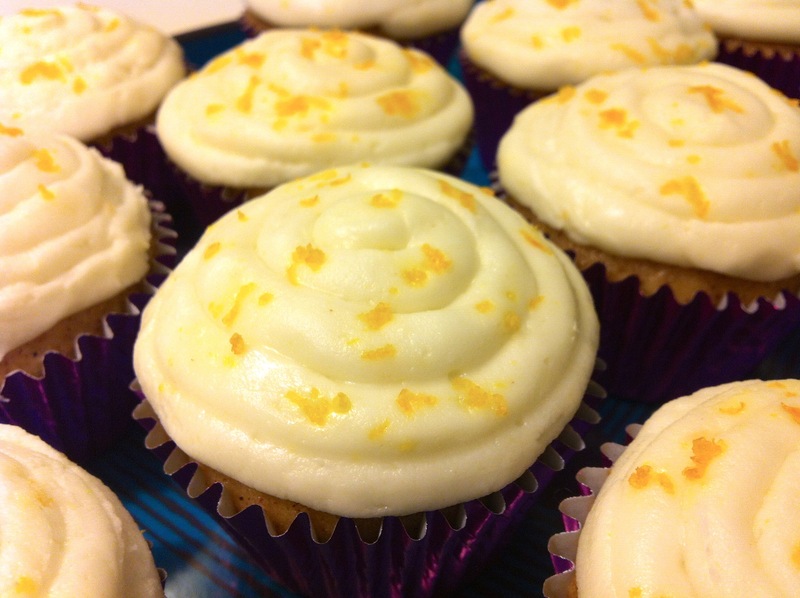 If you have extra orange zest, sprinkle some on top and gently press it into the frosting so it stays in place. Merveilleux! 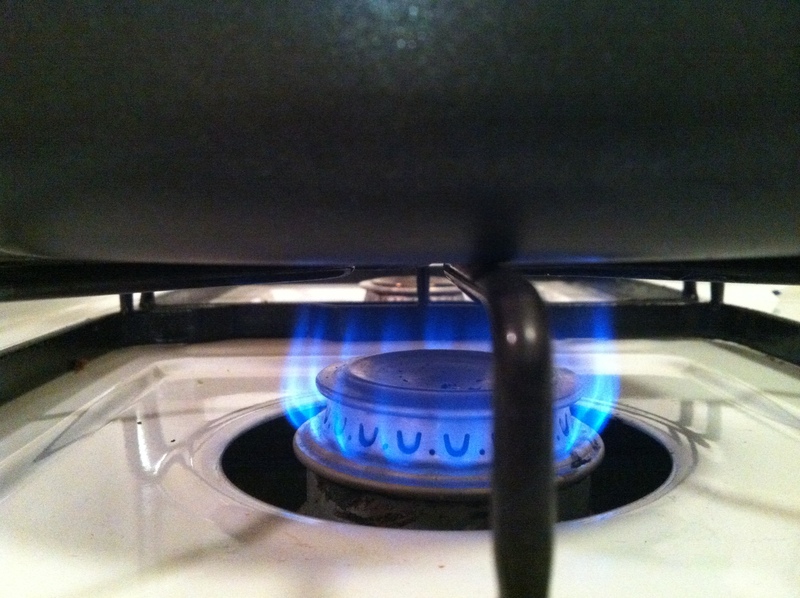 Keep the flame low or else you’ll risk heating the butter too quickly and burning it. As you heat the butter, it’ll start to bubble. Keep stirring and watch closely. 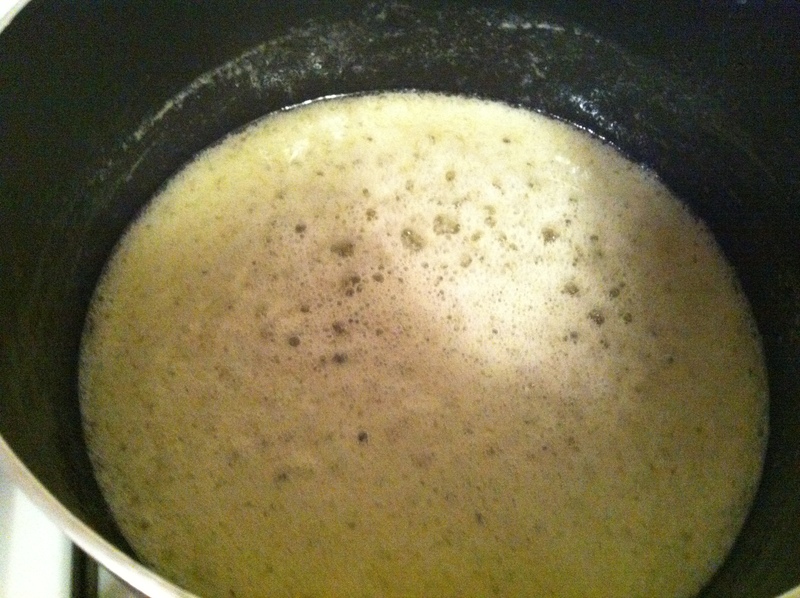 When you stir, you’ll be able to see the butter below the bubbles. Look at what color it is – when it switches from yellow to amber, you’re done! Save some of the orange zest to decorate the tops of the cupcakes. So cute & fragrant! *Note: In researching ideas for using oranges, I came across this impressive post all about oranges. If you ever wanted to know anything about oranges, I’m sure you could find it here!